Over the years, many authors have advanced the view that Earth was visited by spacemen in ages past. There are many differences between the various scenarios which have been presented and collectively, they are known as the Ancient Astronaut theories. The most highly developed of these is the one put forward by Zecharia Sitchin. Sitchin claims to have an advanced knowledge of ancient Middle-Eastern languages and to have used it to decipher early Sumerian tablets which tell an extraordinary tale of Earth's history and mankind's origins. 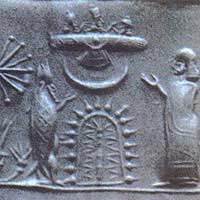 According to Sitchin, the Earth was created when a new planet, called Nibiru, inhabited by a race of powerful beings known as the Anunnaki, entered our solar system, causing massive disruption to the existing pattern of planetary interactions. After Nibiru collided with Uranus, Sitchin believes, some of the disturbed planetary matter coalesced in a different location, forming the Earth. One day the Anunnaki landed on Earth in spaceships. They were interested primarily in mining Earth's gold. Nibiru, it seemed, suffered from some atmospheric disturbance and gold flecks could be used to mitigate the effect of the disturbance on the planet's inhabitants. After mining the Earth for some time on their own, the Anunnaki decided to genetically engineer a slave race to do the mining for them. According to Sitchin, that was us: humans. The Anunnaki created us by splicing some of their own genetic material with that of Earth's native apes. After some time during which we were forced to work as slaves in the gold mines, some of the Anunnaki chose to interbreed with humans, creating a hybrid race. Not all of the Anunnaki were happy about this, however. As a result, when Nibiru was due to pass close to Earth in its predictable long-range orbit, some of the Anunnaki chose not to warn Earth's inhabitants of the possible danger. Nibiru's proximity caused the Great Flood on Earth, almost wiping the human race out. Some Annunaki were sympathetic, however and took steps to ensure that we survived. Sitchin believes that Nibiru continues its elliptical orbit around the sun, returning every 3600 years close to the Earth where its gravitational pull can unleash cataclysms. Furthermore, he thinks that major figures from the Anunnaki's history on Earth came to be worshipped as gods in the religions of Mesopotamia, the region where they first established their presence on this planet. Most of Sitchin's work is based on his reading of ancient texts in obscure languages. How Sitchin came by his mastery of these languages is not clear. There is no evidence that he ever underwent formal schooling in them. Since so few people know these languages, it is also difficult for others to critique Sitchin's work. One linguistic scholar who has reviewed Sitchin's claims, however, believes his interpretations of the ancient texts are profoundly wrong and that Sitchin's knowledge of the languages in which the texts are written is rudimentary at best. If you are interested in pursuing the subject further, you will find articles Sitchin has written on his own website. Although mainstream science scorns them, Sitchin's ideas are popular and have attracted a devoted following. Debate rages among Sitchin supporters about when the mysterious planet Nibiru will return to wreak havoc on Earth. Sitchin himself favours the year 2085 but others believe it could come as early as 2012, corresponding to the end date of the Mayan calendar. If they are right, we should know soon enough. One would have to be a moron to buy into Sitchen's mythological nonsense. The Anunnuki is born of minds that are at the most rudimentary levels of consciousness and that interpret mythology literally. These types are fundamentalists and do not understand symbolism.